I'm sure most of you are familiar with the phrase "It's not the heat it's the humidity". That has never been more true than today. I went outside this morning to take my photos and first off, couldn't do it in my front yard where I usually do as the morning light is better because my neighbor was having their lawn service done. Then secondly, my camera kept fogging up because of the humidity! That is a first my friends. It was so bad I had to keep wiping the lens off. So, my first picture ended up with a bit of a dreamy look to it thanks to the fogging of the camera lens. Anyway, I'm back to work today and tomorrow. It will be quiet and slow which I don't mind that much. Plus my building is nicely air conditioned so I don't have to endure today's heat and humidity! It was so nice being off for a couple of days though! I really enjoyed myself the last few days. 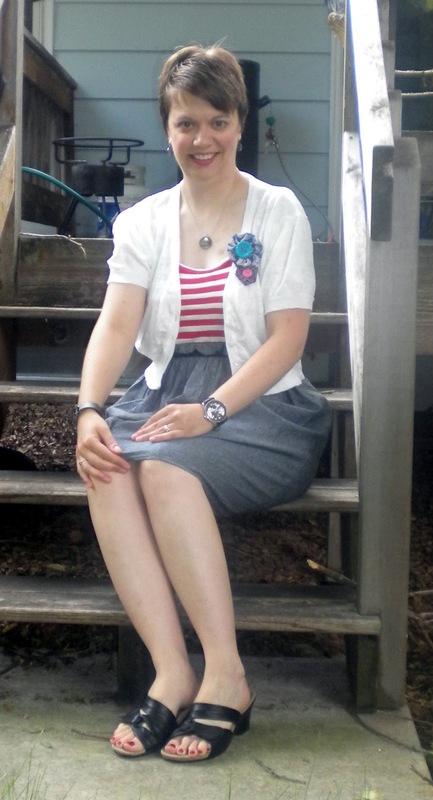 I kept my outfit simple today and kind of kept with the patriotic theme just a hair. Mostly I picked this for comfort though, nice cool sundress. You just can't go wrong. This heatwave is supposed to break for a bit sometime tomorrow. 80 degree weather sounds so nice right about now. I can only wonder what the rest of the summer has in store and it's only early July! One day at a time right? Cute outfit. The humidity here is awful (we're on an island). Hang in there! It is just as bad here! Ugh, at least you look cute! Lol, I am the same way, looking forward to being at work just for the AC! It is sweltering here too and doesn't look like there's any relief till next week, ugh. I'm been hanging out in the a/c :) Your dress is really cute with the stripes on top! our air has been out all week, so i have slowly been getting used to it. but last night was the first night i was truly uncomfortable. they are coming to fix it tomorrow. yay! this dress is so cute, i love the red stripes. You know what? I love your dreamy quality photos...probs the only positive thing about that awful humidity yesterday! Hope you stayed cool :) Also, liking the patriotic theme...it's not too much but a great nod to the holiday! You look nice and cool, Beth! I like the soft-focus look of your picture. We're finally getting some warm-ish weather here. Cute!! And it looks very cool and comfy! Aww just think of the first one as a "natural" filter. 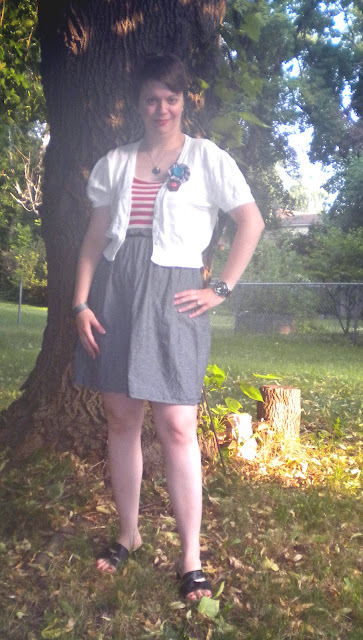 ;) You know I love this look, fab red and white stripes with adorable buttonflowers! I'm always so happy to see people wearing them. I got the giveaway package today...thanks Beth! :) I'll have to pay more attention to how you wear your button flowers so I can get some good ideas!! Love your outfit! I couldn't get myself to be too festive this year, but your outfit makes me want to give it a try! What a cute dress- I love how it looks like a separate skirt and top! Very cute button flower and I hope your work week stays calm, always easier after time off! This humidity really is ridiculous. I kind of kind of like the dreamy quality of the humidity photo though. That dress is super cute too. Hopefully it'll cool down and we can finally enjoy the heat without melting.